The Real Mother Goose. Who Was She? Did She Really Exist? In fact, we don't even know if there ever was such a person. Of course, we all know what Mother Goose looks like. She's usually drawn as an old woman, wearing a shapeless dress and a shawl and she appears on the cover of various collections of Mother Goose rhymes. Over the last fifty years, various people have tried to trace the Mother Goose rhymes back to their origins in order to discover the truth. Was there really was a woman known as Mother Goose who told stories and recited rhymes for children? The result of all this research is that there are a number of theories and at least three possible contenders for the title of the real Mother Goose. Sadly, the evidence suggests that there never was a real person known as 'Mother Goose'. Still, it's interesting to look at where the rhymes originated and how the legend came about. 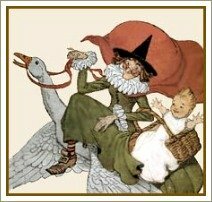 On this page, I look briefly at each of the theories about who the real Mother Goose was and how the stories came to be associated with her. Some of the first written references to Mother Goose appeared in France in the 1600s. 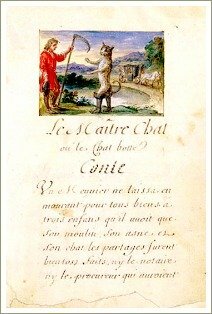 In a 1638 book there is a reference to contes de ma mère l'oye (tales of Mother Goose) and in 1650 a French author named Loret published a book was called La Muse Historique which contained the line‘comme un conte de la Mere Oye’ (‘like a Mother Goose story’). The Loret reference seems to indicate that the term was already a familiar one in 1650, in France at least, although there is no explanation as to who Mother Goose might have been. One theory is that the image and name ‘Mère l'Oye’ may have been based on ancient legends about a French Queen - or Queens - named Bertha. In fact, there were several queens with this name in France during the 10th and 11th centuries, one who was referred to as Berthe la fileuse (‘Bertha the Spinner’) and another (or possibly the same one) who was known as Berthe pied d'oie (‘Goose-Foot Bertha’). Apparently French legends refer to one of these women as spinning incredible tales that enraptured children. This sounds like a good theory but Iona Opie (see note below) says that there is no evidence that Loret was referring to either of these French queens in his book. This image is from a late 17th century handwritten and illustrated version of the book, showing Puss in Boots. In 1697 a French author named Charles Perrault published a collection of eight fairy tales which included Cinderella, The Sleeping Beauty and Little Red Riding Hood. The book’s title was Histories and Tales of Long Ago, with Morals, but the frontispiece showed an illustration of an old woman spinning and telling stories, accompanied by the words Contes de ma Mere l'Oye ('Tales of My Mother the Goose'). But again, there was no explanation as to who ‘My Mother the Goose’ may have been. In about 1765, John Newbery, an English publisher, adopted the Mother Goose name for a collection of mostly traditional rhymes. 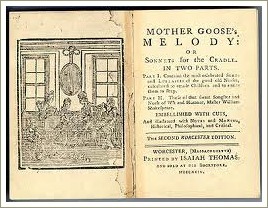 The book was called Mother Goose's Melody: or Sonnets for the Cradle. and changed the focus from fairy tales to nursery rhymes. Again, there was no explanation of who the real Mother Goose was. In 1860, a sudden claim was made that the real Mother Goose and author of the Mother Goose tales was an American woman, called Elizabeth Foster Goose (1665-1758). 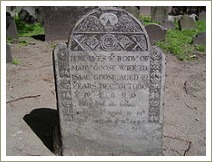 Elizabeth Goose was the second wife of a Bostonian man called Isaac Goose (alternatively named Vergoose or Vertigoose), who brought to the marriage six children of her own to add to Isaac's ten. After Isaac died, Elizabeth went to live with her eldest daughter who had married Thomas Fleet, a publisher. The story goes that 'Mother Goose' used to sing songs and rhymes to her grandchildren and other children swarmed to hear them. Finally, her son-in-law gathered her jingles together and printed them. Scholars have searched unsuccessfully for the book he claims to have printed but it doesn’t appear to exist. In addition, all the dates connected with the Boston claim are wrong. In spite of this, people continue to visit the grave they believe to be Elizabeth Goose’s. I say 'believed' because Elizabeth Goose's grave is unmarked and the headstone they are shown actually belongs to a ‘Mary Goose’ who died in 1690, aged 42. The grave is at the Granary Burying Ground on Tremont Street in Boston, Massachusetts. Where Did The Name ‘Mother Goose’ Come From? So no-one knows who the real Mother Goose was. Probably she didn't exist at all, at least not as the author of the tales and rhymes we know today. Yet the name ‘Mother Goose’ had to come from somewhere. There’s no proof but the evidence seems to suggest – and I believe – that the name ‘Mother Goose’ was borrowed from a woman who had the surname ‘Goose’ or from one who had a nickname like ‘goose-footed Bertha’. For whatever reason, the name was then attached to some of the rhymes and tales and the association stuck. Publishers kept the name when the stories started to be written down because they were, by then, so well-known as the Mother Goose tales. So the publishers continued the association, thereby perpetuating the Mother Goose myth. Whoever the real Mother Goose was, the only thing we know for sure is the sad fact that her story had been well and truly forgotten by the time the stories first came to be written down in the 1600s. Opie, I; Opie, P. (1997). The Oxford Dictionary of Nursery Rhymes. Oxford University Press: Oxford. Iona Opie and her late husband Peter are leading authorities on children’s literature generally and on the Mother Goose tradition in particular. They've written a number of books on the subject and have also edited various collections of Mother Goose rhymes.